Hailing from South London, Burial doesn’t play live or DJ, at least under this guise, and has managed to remain, in an age of information overload, totally anonymous. It is the music, and the music only, that matters. Burial first emerged in 2005 with the South London Burroughs EP, and has, following the release of his debut album in 2006, published a further two EPs. His second album, Untrue, takes his sound to an entirely new level. While Burial laid out utterly glacial, largely instrumental, compositions, Untrue reveals sumptuous soundscapes, wrapped around deconstructed vocal samples. Below the beats, the sonic backdrops have become richer, warmer, denser, and add an element of tension to Burial’s sound. Right from the onset of the achingly beautiful Archangel, which, following an untitled atmospheric vignette, opens the album, the tone is set. A voice twisted, distorted and looped cascades over a devastating groove and shifts the focus from the beat to the intrinsically human aspect of the music. Although segments of phrases can be heard, they are assembled in no particular order, emphasizing the emotional aspect of the music through sound rather than words. 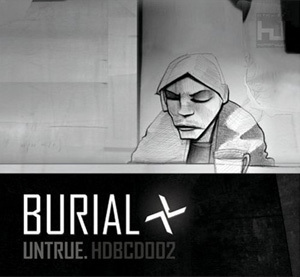 All the way through Untrue, Burial assembles haunting abstract tales of suburban life, places them against sombre landscapes and renders them with implacable beats, creating an incredibly coherent and consistent collection which has very little in common with anything else around. Each track takes on a particular dimension, with its own miniature world deployed for all to contemplate; yet, beats resonate from one piece to the next, sound waves echo in multiple instances throughout, bass lines ripple well after they have crumbled and disappeared. Untrue is moody, tensed, emotional and threatening in a way that its predecessor only hinted at. Near Dark, Homeless or Raver pursue the thread began with Archangel as Burial throws debris of vocal samples, processed and cut in such a way that one is left to join the dots in any way they see fit, while the music and rhythmic patterns develop and act upon the emotional core of the respective pieces. Ghost Hardware, Etched Headplate or Untrue are more introvert pieces, with the rhythmic drive pulled back and given a less upfront slant, but the impressionist canvas upon which Burial works remains as vibrant and poignant. When Burial drops the beats entirely, his compositions become dense and vaporous textural ambient essays which only consolidate the atmospheric spread of this record. Of these, In McDonalds, with its warm elegant waves that come crashing over rudimentary female vocals, is the most heart-wrenching here. Endorphin and Dog Shelter swerve between the vast scope of underlying sound waves, the haunting calls that fly past and the recurring static crackles that are heard bubbling just below their respective surface. Very much like Autechre or Photek in the early stage of his career, Burial devises a sound that is not only uniquely his, but which revolves outside of common musical forms. With Untrue, he overcomes the difficult second album syndrome with elegance. As he revisits the minimal tones of his debut and adds dense layers of textures and emotion, he opens up his sound and reinforces it to the point where his debut album now almost pales into insignificance. Blimey, you really do like this one a lot, don’t you? A nice and enthusiastic piece from a slightly different perspective than others I’ve read. You’ve not mentioned anything about the echoes and ghosts of a decade’s worth of UK urban/suburban dance music, which I think are soooo integral to the sound, but it’s nice to read a different point of view. “Untrue is moody, tensed, emotional and threatening in a way that its predecessor only hinted at.” In reference to this comment though, I would suggest a close re-listen to the first album again and also perhaps, the track “Exit Woundz” from the b-side of the “Ghost Hardware” 12″. I think the Photek comparison is always pertinent and he’s a very obvious influence. Both are seemingly particularly obsessed with texture and rhythm and both come from “inside” their scenes (jungle/d&b and (post-)UKG) and are somewhat reverent to them while doing something strikingly new. On the Hyperdub site there’s a little interview with Burial where he says he’s listened to nothing much aside of A Guy Called Gerald’s “Black Secret Technology” for about a year. Interesting, as when Gerald was working in jungle he was another insider/outsider pushing the envelope like Photek – but crucially had a much bigger interest in melody and vocals. His often cheap, pulled-from-a-dustbin drum sounds bear more than a passing resemble to Burial’s too. Or the other way around. I am really bowled over much more by Untrue than I was by Burial, I think partly because it is much closer to the kind of sound I love. It’s virtually taken over my iPod at the moment. I just can’t get enough of it. I just really love how he combines beats, ambient textures and vocals, it just works incredibly. I haven’t made any reference to the ‘ghosts of music past’, partly because everybody else does, but that’s not a good enough reason. London is probably very much part of his sound, but somehow it is not something I feel strongly in the music. I am probably the only one in this case, and I don’t think it’s got anything to do with the fact that I am not originally from London. I understand what you mean though, and it is something that he emphasises quite strongly in the interview he gave to the Wire, especially as he kinda missed the whole rave thing as he was too young, but his older brother was going to them and buying all these records that channelled the kind of energy of raves, and he grew up with that as a point of reference. He’s kinda nostalgic about something he’s never really lived, that’s what his music is based on. You’re right about the tension and moods being present on earlier tracks, and that is what kept his first album so tight, but I think they are crystallised in a very particular way on the new album or recent EP tracks, including the Ghost Hardware EP in its whole. Shutta is an awesome example of this. I was listening to Modus Operandi the other day. It still sounds blinding now, and I would think that both Burial and Untrue will sound as fresh in ten or fifteen years time.